Dispatching a German ultraviolet telescope and a saucer-shaped spacecraft designed to grow crystalline semiconductor thin films in the vacuum of space were launched aboard shuttle Columbia's mission in November 1996. The record-setting spaceflight by astronaut Shannon Lucid aboard the Russian space station Mir concluded with shuttle Atlantis' mission in September 1996. A unique payload flew aboard Endeavour's May 1996 mission designed to test inflatable structures in space. A Zenit rocket inaugurated a Sea Launch spinoff program to offer land-based launch services to medium-class satellite payloads Monday morning, successfully streaking into space through a cloudless blue sky above the plains of Kazakhstan. The Zenit 3SLB rocket, a modified version of the booster used by Sea Launch on missions since 1999, carried an Israeli communications satellite to orbit during a marathon flight lasting more than seven hours. The 192-foot-tall launcher departed the Baikonur Cosmodrome's pad 45 at 0500 GMT (1:00 a.m. EDT) Monday, or in the late morning hours in Kazakhstan. The Zenit rocket's two core stages fired for more than eight minutes, putting the booster on an arcing suborbital trajectory. Moments later, the Block DM-SLB upper stage ignited to place the AMOS 3 payload in a low-altitude parking orbit. The upper stage completed two more engine firings to inject AMOS 3 into an orbit inclined zero degrees to the equator. The Zenit was targeting an orbit with a high point of 24,291 miles and a low point of 22,236 miles. Deployment of the 2,800-pound satellite occurred on schedule nearly seven-and-a-half hours after liftoff. The launch was postponed four days from Thursday due to an unspecified technical problem uncovered in the final minutes of the countdown. AMOS 3 will enter service for Spacecom Ltd., an Israeli satellite operator, to link the Middle East, Europe and the eastern United States using 14 Ku- and Ka-band transponders connected to four antennas. The satellite will beam direct-to-home digital television programming, Internet services and other multimedia content to customers, according to Spacecom. The $170 million satellite was built by Israeli Aerospace Industries Ltd. to replace AMOS 1, an aging spacecraft in orbit since 1996. AMOS 3 will be positioned along the equator at 4 degrees West longitude, directly above the eastern Atlantic Ocean near the African coast. "AMOS 3 is at the forefront of communications satellites in the world," said Itzhak Nissan, IAI president and CEO. "This is another achievement to Israel Aerospace Industries, which is the prime contractor for all space-related programs in Israel." AMOS 3 will operate for up to 15 years, providing communications for both commercial and Israeli government clients. Thales Alenia Space and Telespazio of Italy teamed to supply the craft's communications payload. The satellite's broadcasting capacity is expected to be worth up to $40 million per year in revenues, Spacecom officials said. "The successful launch of AMOS 3 is a significant milestone for Spacecom and for our partners who have contributed to this multi-year effort," said David Pollack, Spacecom president and CEO. "The satellite will offer customers extended coverage and service over its target regions and will enhance operations and drive revenue." Officials say the spacecraft will soon be renamed AMOS 60 in recognition of the 60th anniversary of Israel's independence next month. 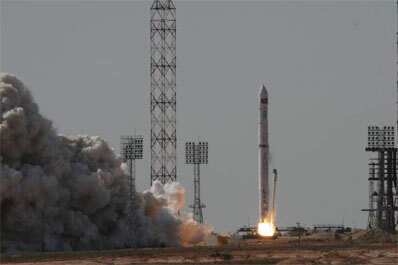 Monday's blastoff was the first mission for the Land Launch project, a joint initiative formed in 2003 by Sea Launch Co. and Space International Services Ltd., a Moscow-based company providing the program's hardware and services in Russia, Ukraine and Kazakhstan. Land Launch was conceived to reach the markets for medium-class communications satellites and large spacecraft bound for low Earth orbit. Based from an oceangoing platform stationed on the equator in the Pacific Ocean, Sea Launch missions are geared toward delivering heavier communications satellites into orbit. The Land Launch Zenit rocket's Ukrainian first and second stages are identical to hardware produced for Sea Launch flights, according to the company's Web site. Major changes to the Land Launch vehicle include the introduction of a Russian-built fairing to shield payloads on the launch pad and during the first five minutes of flight. Sea Launch rockets use a shroud manufactured by Boeing Co., a primary stockholder in the launch services firm. The Block DM-SLB upper stage also endured several modifications focused on reducing the rocket's weight. The changes shed more than 4,000 pounds from the similar stage used on Sea Launch missions. Engineers swapped the stage's single avionics bay with several lightweight containers, replaced a deployable antenna and telemetry system with fixed antennas, removed a set of fuel tanks for the rocket's attitude control system, and took out a command system that was deemed unnecessary, according to Sea Launch. Engineers also added two control jets to the stage to increase the rocket's reliability. The small thrusters will help settle the stage's kerosene and liquid oxygen propellants before the mission's final major engine firing to decrease the amount of fuel needed for the burn to begin. Land Launch missions can carry more than 3,500 pounds of payload directly to geosynchronous orbit, or about 7,900 pounds to a standard geosynchronous transfer orbit with an inclination of 23.2 degrees. A two-stage version of the Zenit sold by Land Launch is optimized for satellite missions to low Earth orbit. That configuration can transport about 30,000 pounds of mass to the international space station's orbit, or more than 10,000 pounds to a sun-synchronous orbit often used by Earth observation satellites. The next Land Launch flight is slated for late this summer, and another mission is on the books for the end of the year, according to a Sea Launch spokesperson. "We look forward to the next mission, and to providing added launch capabilities that meet each of our customer's needs," said Rob Peckham, Sea Launch president and general manager. Sea Launch is preparing its next mission at the company's home port in Long Beach, Calif. Scheduled for late May, that launch will orbit the Galaxy 18 communications satellite to serve customers in North America.